Depending on whom you trust, sort of, up to two thirds of all the oil we consume in the U.S. is burned in our engines. If you added the section of the infrastructure that directly supports transportation via internal combustion, the number might go up to 90%. Where the hell were all these people going at 11 a.m. on Saturday? Why couldn't they enjoy some quality time in bed with their spouses or mistresses, or play with their kids, or go to church? (For the record: in our section of Brooklyn, a church or synagogue is never further than a five-minute walk from anyone's house or building). What important events did they have to attend, and what was so special about their destinations that apparently couldn't be reached by subway? A neighbor of mine was astonished when he found out I didn't have a car. He blinked, shook his head, and asked, "So, how do you get around?" I pointed out that there was a perfectly serviceable subway station only three short blocks from our building, and I could get anywhere in the city any time (our subway system, literally working around the clock, is not just one of the oldest in the world, but also one of the best) for just over two bucks. Worrying about parking, getting tickets, changing the oil, realigning the brakes, etc, are like life on Mars to me. You can always rent a jalopy for the weekend if you're in the mood for some picnicking and nature-watching. My neighbor shook his head once again, unconvinced. The automotive industry has long since outlived its purpose. It is well within any government's power to tax the private automobile into the ground by raising taxes exponentially on the private use of fuel. For instance, this month, they could levy a 50% federal sales tax on every gallon sold at your local gas station. Three months later, the tax could go up another 50%. And maybe 150% by the end of next year. And then another 200%. Would all these people want to drive on Saturday morning if they had to pay $20 per gallon? I doubt it. They would have to look for other options as well as, generally, better things to do. This would almost immediately cause an economic boom in any country. When people are inconvenienced, they look for solutions, and someone always finds one, especially if he or she foresees a sizable profit that might come with it. One solution would be to built train and streetcar tracks. Lots and lots of them. Unemployment would cease to exist as a concept for many years to come. There would be jobs galore for everybody. It's ironic, but the automotive industry wouldn't have to lose a dime: they would simply shift their focus on producing large electrical vehicles. The steel industry would have to leave China and come back to Pittsburgh: the demand would exceed supply by orders of magnitude during the first few years. Now I don't know whether the system we had in this country before Robert Moses stepped in and changed it all ... when the streetcar accounted for 90% (!!) of all individual passenger trips ... was sustainable, or would be sustainable with a bit of help from modern technology, but it would certainly be more so than what we have now: a step in the right direction, perhaps. Not a single major politician, not a single leader of any country, even mentions this possibility, like, ever. Why not? Do they know something we don't? It is well within any government's power to tax the private automobile into the ground by raising taxes exponentially on the private use of fuel. Not a single major politician, not a single leader of any country, even mentions this possibility, like, ever. Why not? The answer is simple: because the majority of voters drive private automobiles and would decline to vote such politicians into power. Also, arguably the problem is not that people are driving, but that they are all driving in the same place. That means we should be taxing access to the road, not access to the car at all¹. The environmental cost of driving 5 km in New York City is higher than the cost of driving 50 km in rural Wyoming, where public transport or cycling alternatives are unlikely to emerge. Taxing the car overall will just increase the imbalance between urban and rural areas. It's also why in the old Soviet Union, people spent hours waiting to buy bread: Soviet price controls made the price too low to compensate the suppliers, so there wasn't enough bread, so everyone waited in line. 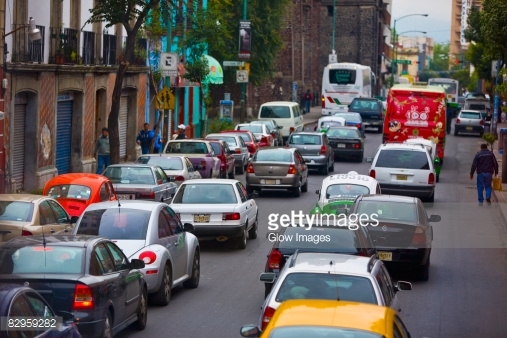 Congestion — waiting in line to use an underpriced road — works the same way. ¹Depending on what you want to achieve. Battle congestion: tax the road. Give a strong incentive to move electric cars: tax unsustainable fuels. Not the answer you're looking for? Browse other questions tagged carbon-footprint cars or ask your own question.